This is a strange one that has been making us sad. I hope you can help. tendonitis in her peroneal tendons (didn't take any fluoroquinolone antibiotics). They have bothered her ever since. problems. Then she did active rest (be active, but nothing that makes it hurt) for 1.5 months, physical therapy, and tried running. After 10 minutes of jogging with no pain, we had to pick her up as her symptoms were similar to when she was freshly injured. Now after an additional 40 days taken completely off, her symptoms have not improved at all. Her hamstrings (especially the tendons described above) are just as sensitive. symptoms. She is a very active 11 year old. We have lived in the same house for 16 years. tendonitis) for 2.5 years. My wife rides a stationery bike 5 days a week for 40 minutes easy. of us first thing next week. wife, and my daughter have no other symptoms outside of injuries that simply are not healing...and we are being very patient. I really appreciate any advice you might have. Hi Bob (keeping it a bit anonymous, though you may or may not care). For the purposes of this conversation, you are in an entirely different category that your wife and daughter. Primarily it's The Levaquin Tendonitis Solution ebook and it's forum for you. 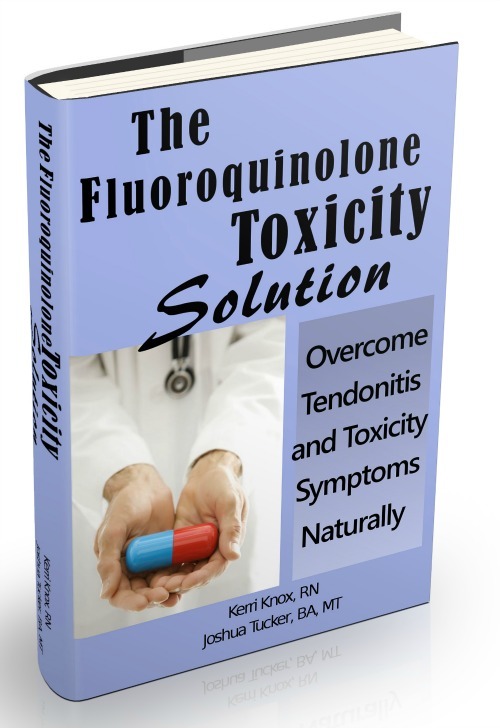 While there may be negative aspects at play before the fluoroquinolone Levaquin, for the moment let's go with that your symptoms are from Levaquin, and focus on your wife/daughter. We can certainly talk about you, but let's talk about wife/daughter first. Confirm for me that the ONLY symptoms/problems your wife/daughter are having are peroneal tendonitis/hamstring injury. When you confirm that, I'm going to respond with the statement that Rest and patience are BAD, VERY BAD strategies for dealing with tendonitis and injury. Sometimes it works out that way, but I wouldn't at all rely on it or assume that it's a winning strategy. Along those lines, if those pains/injuries are their -only- pain/problem, I'm very leery at this point that it's something as insidious as heavy metal poisoning or parasites etc. I'm going to ask you questions, I want an A/B answer for wife/daughter if applicable. 1. What exactly does 'we eat pretty balanced and healthy' mean? 3. Any history of wife/daughter injury other than the current issue? 1. Nutrition - my wife has allergies to wheat and dairy (gets hay fever) which has been the case for 11 years. So, she eats mostly salad, vegetables, canned beans, canned fish, brown rice, fruit, and potatoes. My daughter eats in a more diverse manner. She eats bread, cheese, meat, eggs, vegetables, fruit, junk food, grains, etc. 2. Wife - tightness in calf, "like there is not enough room for everything", peroneal level of pain changes a lot, mainly at joint of tendon and muscle. Otherwise, she's OK. When "it is bad", the entire outside of her lower leg (peroneal muscle) is tight and sore. Daughter - I have pain and my entire legs are sore especially calves ('injury' is in this hamstring tendon though). There are no other symptoms - outside of not being able to be physically active, they seem normal. Obviously there is an element of frustration and helplessness. 3. Wife - She got too thin (borderline anorexic) 3 years ago which implies undernourished. She was ski racing and the peroneal symptoms started then in the spring. Daughter - Had a bit of tendonitis in the fall on her right leg's peroneal. (I am suspicious of this since four years ago, I didn't even know what a peroneal was and now 3/4ths of my family has had problems with one). Otherwise, no history. For the past 3.5 years, I have tried all sorts of things to get better - I've probably been to 100 doctors appointments. I've also taken many different types of supplements and herbs. For the past year, I have not taken anything at all. I just read the levaquin ebook that you wrote and have started taking Magnesium. I will take Vitamin D once I get the Vit D Level test done. My wife takes calcium, magnesium, vitamin d3, zinc, acidolphilus, and a vitamin b complex and now and then Wobenzym. My daughter doesn't take any supplements. 1. It is interesting that you all have peroneal pain. I"m not super worried about that coincidence though. 2. If you have Levaquin Tendonitis, that's a whole other ball of wax. You might all have peroneal pain, but your focus is entirely different than wife/daugher's. 3. Wife definitely sounds gluten intolerant. Which very likely means your daughter is too. See Kerri's Gluten Sensitivity pages. 4. Sooo, daughter has peroneal AND hamstring pain/problem. Ok.
5. Wife has significant peroneal issue. Ok.
6. You have, at the very least, peroneal issue. 7. It is interesting that you all have pain in the same area. I'm not going to theorize too much about that, for a variety of reasons. 8. So. Nutrition is an issue across the board. I really want to see what all your Vit D levels are. Wife needs to go gluten free, sounds like she mostly is. How much of those nutrients does your wife take? You just follow what the Levaquin Tendonitis Solution says. Wouldn't hurt your wife to follow that too. Your daughter may be short on nutrition, just all depends. At this point I'm going with that she's very active, doesn't get enough nutrition in her -and- pushed too hard and got a soft tissue injury. Which can also mean that she's injury-free but stuck in a Pain Causing Dynamic. Which is very often essentially the same thing. For wife and daughter, nutrition is a player for sure. If you want a quick fix and long term solution to the physical sides of things, I highly suggest you check out The ARPwave System. It's a no brainer for the level at which your active family wants to perform at. Nutrition aside, the electrical/musculature of your wife/daughter is not operating optimally. There's an electrical dysfunction. The ARPwave will fix that. The ARPwave will not fix Levaquin tendonitis. That's further down the road for you. Having said that, you can sleep on the background charge, and I suspect that that, combined with getting the nutrition in you that is required, will go A LONG WAY towards helping you recover far quicker than expected. I suspect your daughter will be back on the road with in in a matter of weeks. Probably the same with your wife, though when you said 'skinny/anorexic' it does make me wonder re: what's up with her system and her overall nutrition. Aside from the ARPwave, I'm curious: What have wife/daughter done massage/pt/stretching wise for the pain/injuries? My daughter had peroneal issues, but not since the fall. Her symptoms are limited to hamstrings. My wife eats no wheat or dairy. She is gluten free I think. Both have done physical therapy including icing, massage, e-stim, as well as stretches and exercises. All of this didn't bring any progress for either of them. As I mentioned earlier, my daughter was NOT training a lot. She does way less than her competition. The injury occurred in gym class doing unsupervised weights. I also described my symptoms which are shoulder (bicep tendon), both hamstrings, and both peroneals as well as some foot muscles. My issues are not at all limited to peroneals. My wife takes vitamins in what I described above in amounts about equivalent to the RDA. Yes, as I said, you're in a different category with the Levaquin. Pain in multiple areas is to be expected. RDA stands for 'Really Deficient Amounts'. If you wife used to perform at world class levels, and still wants to go that direction, flat out she's just not getting enough nutrition into her (and over the years she became less 'full' of nutrition. What caliber of massage therapist did she have? What kind of massage? How much, how often? I generally don't expect PT to help much, same with e-stim, and I assume that 'icing' means the use of an ice pack in the standard 20 mins on, 20 mins off, etc. The peroneal is hurting your wife for a variety of reasons. If those specific reasons don't get dealt with, nothing's going to change. Ice packs don't have a chance. Do you know if she actually tore something? Or is it just hurting? Does it hurt all over, or just in one spot? What specific actions cause pain? Was there a specific point in the weight room where she knew she just hurt something, or did it show up later? My wife has no interest in being a competitive athlete anymore. She just wants to be healthy and active. She doesn't race and has no interest in racing anymore. She just wants to heal so she can ski recreationally, hike, etc. My daughter hurt her leg on a seated leg curl machine. There was a strain for sure, but we haven't gotten an MRI done yet as it didn't appear to be anything that needed surgery and we figured in any case the treatment would be similar. The muscle is strong, she just has tendon pain. Running and sudden movements that recruit the hamstring hurt it. Yes, there was a specific point where she knew she hurt herself. That was 3 months ago though. The ARP Wave people look like scam artists especially if you research the comments from people who have dealt with them. I wonder if there are any treatment centers that we could go to in Utah to get the treatment? You stated the EXACT key to this whole conversation. You said your wife just wants to 'heal'. This may be a little bit of semantics, but from where I sit, it's a VERY important distinction. If your wife/daughter has an -injury-, then 'healing' is the goal. So if there's no injury, there's nothing to heal, per se. But if muscles are (locked) too tight, connective tissue is (locked) too tight, lack of certain nutrition isn't allowing the body to relax muscles or turn off the inflammation response, if the nervous system is on high alert because it THINKS there is injury or that there's danger of injury....those are all factors that cause pain, and cause chronic pain and dysfunction. That's why time and rest are poor methods of 'healing'. That's why the 'stretching and strengthening' PT generally relies upon doesn't work. That's why massage either poorly applied or not applied enough doesn't work. That's why ice packs don't work. At a deeper level, there's the compensation pattern that caused the pain in the first place. When muscles don't fire properly, A. compensation pattern develops and B. force doesn't get absorbed but still has to go -somewhere- (injury site). That's partly why the ARPwave is so effective..it fixes compensation pattern. ARPwave definitely isn't a scam. There's plenty of good review too, including mine (fixed my L5-S1, my neck, etc), like this one: "I am a sports agent and have several of my NBA clients on ARP. This machine is a God’s Send and the ARP people (Denis especially) could NOT be more professional and capable. My players make their LIVING off their legs and knees and ARP has not only cured some of their issues, but I FIRMLY believe will extend their careers." Having said that, it's not for everyone for a variety of reasons (price, intense sensation, it's not a cure all but is incredibly effective at what it's effective at, sounds too good to be true, etc). Where are you seeing people crying foul? I'm always curious to see what people are saying. Aside from the in-home treatment, I'm pretty sure there's ARPwave people in Utah. I'll ask on Monday. That would be great if you could ask. I looked at all of the ARP websites and videos but also did a google search on "ARP treatment not working" and variations thereof and saw many negative comments not so much regarding the treatment, but regarding the way the ARP people treat their clients. I would much rather find a treatment center where I could deal with people directly face to face. Your description sounds exactly like my wife's and my daughter's symptoms. Actually I have symptoms that are very much like that too in addition to my tendonitis. I imagine that this has something to do with needing more D3 and/or Magnesium. I'm looking forward to what you might learn about ARP treatment centers in Utah. 1. I'll ask, no problem. I definitely appreciate the face to face aspect. When I first pursued the ARPwave thing, I drove across multiple states to do face to face. And if I hadn't first bumped in to a guy at a sporting event and gotten a 5 minute taste of the ARP that took 100% of 3 years of disc pain/limitation away (for a full 20 days until tightness/pain started to pull back in), I never would have A. believed the claims nor B. drove across multiple state lines to get 10 sessions, and then gettting my own. Now I have my own, and happy to pay the $ price. I love being able to walk, run, lift weights, etc with no fear of injury and confidence knowing that if there is injury, it's a quick fix. Doubt and distrust is just part of the pathway, no problem. The proof is in the pudding, as they say. 2. Wife and daughter definitely need (more) magnesium. In general just from what you said, IMHO more protein and good fat too. 3. You had mentioned searching for parasites, etc. It's not a horrible idea, as there's been world travel, etc. Daughter seems like just a physical thing, wife -could- be more in the running to get some tests. There's regional nutritional deficiency (not getting good food/the right food), there's h pylori infection which has all sorts of weird symptoms available and affects entire families, etc. It's not a bad idea if you have the resources. I'm not left with the impression that you need to or should, but it may be interesting to do some testing on the wife and see what things look like before doing the rest of the family. 4. I should probably just deal with you on the Levaquin Tendonitis Forum, but since you're here, list for me all your symptoms. Various joint and muscle pain, and dizzyness etc? Break it down and list ALL the symptoms that showed up from/after taking the Levaquin. The more details/story, the better. Look at the season Peyton Manning is having.....an ARP Wave client. Look at the season Andre Johnson is having....an ARP Wave client. They have more than 500 NFL Clients and counting. I USE the ARP with great success and avoided KNEE SURGERY BECAUSE OF IT IN 2008. Thanks for sharing! I'm also a huge fan of the ARPwave. It saved me from ruptured disc surgery. Pissed that I can't even take a knee anymore after 7 days of Levaquin. Retired military. I have always lifted weights. After taking 7 days of a 10 day prescription I began having tremendous wrist pain. So much so that I had to stop doing arm curls. Then it moved to my elbows and forearms. It' still there after 4 to 5 months after taking Levaquin. My VA doctor told me it would go away if I stopped working out. WRONG! My right knee is also a major injury. I can't bend down and put any weight on the ground with it. EXTREME pain and numbness at the same time shoots through my knee down to my foot. This is absolutely crazy! I need a good lawyer. I agree, get a good lawyer! It doesn't do much if any good going after the pharmaceutical company for a variety of reasons included being protected from lawsuits by the government, but hear some people are getting good results going after the doctors themselves for malpractice. Then again, they're legally protected pretty well by the AMA (american medical association) and the legal system. Unfortunately, as your doctor exemplifies, they just don't spend any amount of time looking into the drugs they prescribe daily. There's a black box warning, for god's sake, and while some people's symptoms go away in short order, MANY more don't.